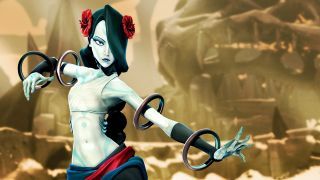 Battleborn will get its first free DLC character next week, but you may have to wait another week to unlock her if you don't have the Season Pass. Alani, an Eldrid warrior-monk who commands water to harm enemies and heal allies (and who will henceforth not be referred to as a water-bender for legal reasons), will be available starting on May 24 at 9 am PDT / 5 pm BST for Season Pass owners and on May 31 for everyone else. Each of Battleborn's current characters can be unlocked either by completing certain in-game challenges or by reaching a certain command rank. Alani will be different: the fightin' mer-monk will instead cost 47,500 in-game credits to unlock, or you can unlock her with a Hero Key. Speaking of which, each Battleborn Season Pass owner will get five free Hero Keys along with early access to each of the upcoming characters. The keys can also be used to skip the unlock requirements for existing heroes, and you'll even get the key back once you meet their original requirements. PS4 players who participated in the Battleborn Open Beta will be awarded an additional free key on May 24, as well as the first DLC story operation when it comes out. And if you've still got a bunch of things to earn before you even start thinking about DLC, you'll want to catch the upcoming double XP event. From Friday at 8 am PDT / 4 pm BST through Wednesday, all story and competitive missions will award twice as much Command Rank and Character Rank experience. So many unlocks, so little time!